Lacs of people commute by public transport - be it a local train, bus, auto, taxi, metro train or a tram. And like I always do; I will be writing about Mumbai. Public Transport is more than a lifeline of Mumbai. Everyday, more than half of the Mumbai travel by the local trains and BEST buses to and fro. If you are visiting the city for the first time, and if you happen to be on any of the stations during the peak hour; then God save you! But for us Mumbaikars, the day we do not see this crowd, we get nervous. Even on a Sunday, we expect to travel standing with hardly any room to stand or without getting stamped on your feet! I have travelled for eight years by local trains; and enjoyed every minute of it. If you travel by the same train each day, then you usually find your "9:27 local Train Group" who reserve a seat for you, or give you their seat to sit for a while, chitchat, sing song and such other activities happen within the "Group". 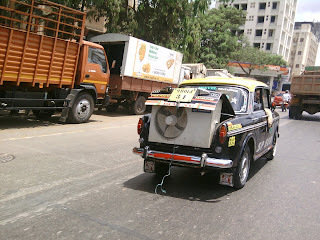 And the Mumbai city Autowalas. I am sure they will throw more tantrums and weight around than our celebrities! You have to be born lucky to get an auto each day within five minutes. But you know, Mumbai autos and cabs are used not only for the public transport; but other objects get the privilege too, to be a passenger and take a ride. Again, like always the spirit of the city surprises me. In one of my posts, I had mentioned about what all kinds of work people do for their living. 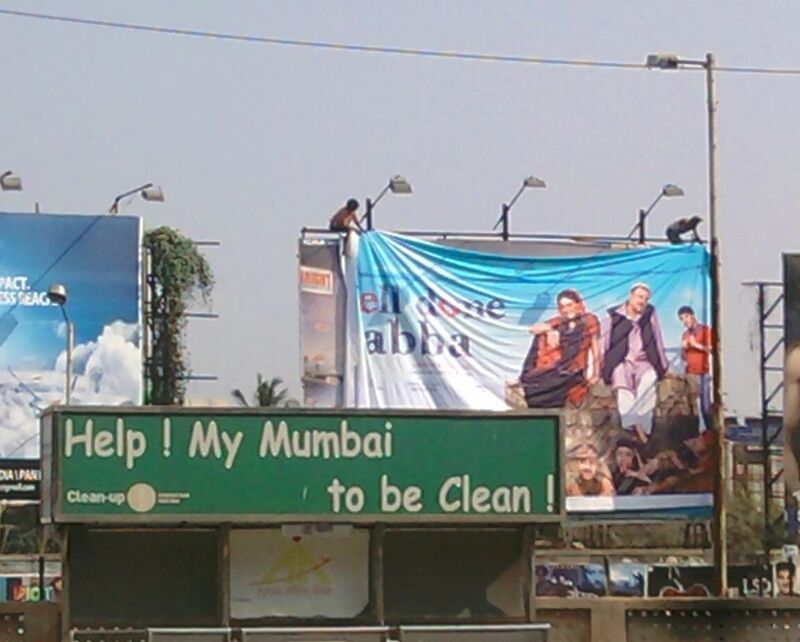 Two men were changing the hoardings under the sun without worrying about the height factor! Commendable job they do. 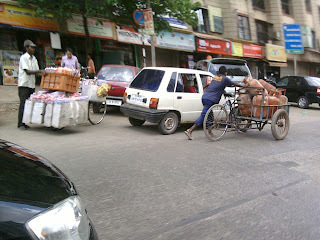 But another set of people who carry more weight than they can pull of on their cycle or push cart. Ain't they amazing? 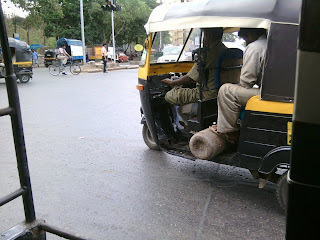 Last, but not the least - there are nice autowalas too around. Like the one who took me around the Mumbai suburbs this morning, without complaining once about the waiting time for which he did not charge me anything. All I could say was "Thank You"! Mumbai Local Trains... the good network and frequency makes it easier to commute. I have not traveled much on the central and harbour track but western track is just too good...fast and many many trains. Bengaluru is gonna beat Mumbai in traffic very soon and before that happens I wanna be out of here. There is gonna be more crowd than there. What apt timing...even I was in mumbai today...and did quite a bit of travelling, local train, bus,taxi, auto everything in one day!!! 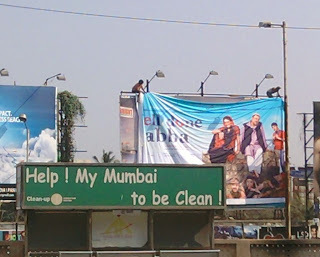 !...and mind you it is a headache for a non mumbaikar....I dont know how u guys do it every day!! Never been to Mumbai,but have heard bout the local trains. . The ad about a suitcase on tv also gives some clue bout the rush during the peak hours. . Even i Kolkata i try not to use local trains and use buses and metros. . So if i am in mumbai someday, god help me! of all the cities in India I like Mumbai the best...it's the people! I cant forget the day in morning peak our local,when I was to get down at Dadar, but the compartment was so full that I couldn't come out and the next station was Byculla where I alighted. That is Mumbai, and still Mumbaikar doesn't complain. Well Mumbai is stinky, crowded and dirty yet it is so beautiful!! Loved your photography! You surely put a lot of thought in this article! Trains are the lifeline of Mumbai, no doubt. Then there are the buses, autos and taxis - in that order. Very soon, the Metro will join in the race as well! Mumbai has lots of traffic for sure but Hyderabad has the worst. There are absolutely no rules here. Its scary to drive or a a pillion. Dont get me started on Auto walas. Some drive as if they are gonna compete in upcoming F1. About autowallas, this i saw in Pune also..they dont cheat you, and return the change without any grudge..hope their counterparts in other parts of the country learn something from them. Wow, Neha! I really love reading your posts on Aamchi Mumbai! You've so rightly said about local trains being our lifeline. I've been commuting in local trains during peak hours for the past year, and also for the coming 4 years of my life just to attend college. It's simply a thrilling experience to travel in trains, isn't it? By the way, you've compiled the photos in a really cool manner! Way to go, Neha and looking forward to such many more posts on Mumbai! and Autowala I had strange experience when i asked to go to i think it was Vileparle east they would say no .. but was fun travelling in them loved it ..
traffic is a very big problem in India. 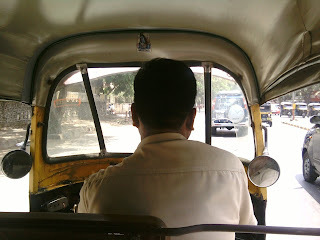 Still we find good auto drivers. Remember when the motormen went on a strike...god it felt as though we were struck by some calamity...I traveled home sitting in somebody's car dickey...how did u go home. I'm so sorry not to have commented on your posts lately, but i do have the perfect excuse for it... my shaadi, you see. 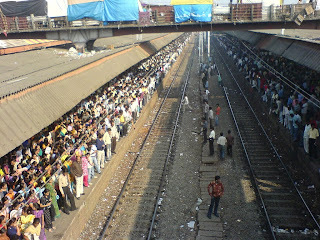 you had took us to a tour around Mumbai..
im shocked by the waiting crowd in the photo of the rly stn, is that a daily scene? I wish we had public transport in the USA. That was a vivid and lively description of Mumbai. I have to admit, being a Delhi- ite, I don't get this love Mumbaikars have for their city. Delhi -ites usually only complain( even tho' they love their city too!). Spare a thought the traffic cops who stand despite the heat, dust, and morons on the road ! As Mumbai have good local Rail network most of the people rely on local Rails, while in Delhi people more go for City buses. But now as the Metro is expanding everyone give a go to it even when there is much crowd there and why not if u get the AC going there in this scorching heat who cares about crowd. by the way good blog u have. ..quite good pics.reminds me back home mumbai! @ Nishant, thanks..the photos are clicked from a moving auto..Metro is creating chaos right now..so much traffic due to under construction work! @ Harini, lol, chill girl..all the cities are bad these days thanks to the population..
@ GV, bapre..dickey me? I know, one strike in any transport and we are stranded! @ Oxymoron, welcome here..thank you for your comments..we all believe that our city transport is worse; the fact is that all are the same thanks to population!